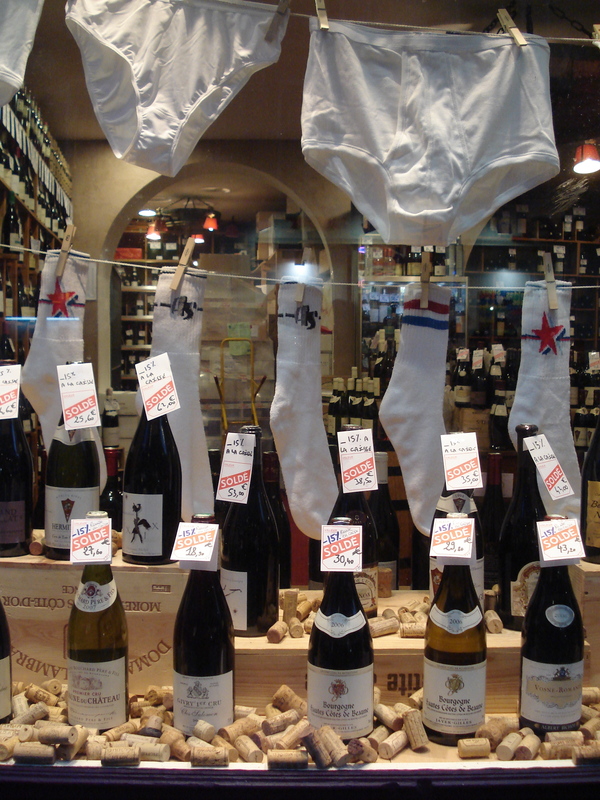 How can you not laugh when you see a row of over-sized underwear hanging in a wine shop’s window? Twice a year French boutiques and department stores transform themselves into one of three kinds of art. Either they become life-sized Warhols and Pollocks, bursting with bright gaudy ribbons and attention-grabbing window signs. With yellow, blue, pink and green stickers advertising reductions and bold pen slashes spoiling once pristine price tags, these shops come alive, blaring with color. Or, shopkeepers get risque. They undress their headless mannequins from head to toe and wrap single ribbons around their skinny waists, clearly revealing those normally unrevealed body parts. Or, as in the case of the wine shop we found last Saturday (Les Caves Bossetti, 34 rue des archives, 4e/Specialty: wine from Burgundy), they hang up underwear. During the soldes anything goes. For a good six weeks starting in both January and June, Parisian shops open their doors to an inimitable combination of curious foreign tourists and haughty, in-the-know Parisians, all looking for a good deal. La Chambre de Commerce et d’Industrie organizes this much awaited bi-annual event and shop owners take it very seriously, respecting all rules and regulations. The night before the pre-arranged start date (January 12 this year), employees methodically prepare their simple, yet catchy, window displays, slash price after price and bring out hibernating articles that have been saved just for the sales. We actually participated in the first days of the sales this year – and what fun, as long as you stop for a break. You can go pretty much anywhere in the city (or all of France, really), but we stuck to the Marais area. Here you have both BHV (a classy department store where one seriously can spend four hours without realizing it), as well as smaller, one-of-a-kind boutiques. I always like looking for original, slightly funky finds – so these shops are for me. Also, we discovered that the Marais is the best place to shop for men’s clothes (the BHV men’s store is even bigger than the women’s floor – note, “store” versus “floor,” please!). In addition to clothes, the Marais has great home-decorating boutiques and isn’t far from the bundle of cookery shops on rue Montmartre, near Saint-Eustache church. Don’t think the soldes are easy. You have to take a break to eat. In the Marais, try Le Pain Quotidien. (18-20 rue des archives, 4e). A cozy place for fresh tartines and salads. You also have to do like the people around you: be decisive. There’s no coming back for it later! Did I mention that even wine is on sale? This entry was posted in Everyday Life in Paris and tagged restaurants, travel, wine. Bookmark the permalink.